Corinne is the daughter of the Musketeer D’Artagnan and has grown up dreaming of becoming a Musketeer herself. On her seventeenth birthday, her mother gives her a letter of introduction to Monsieur Treville, the head of the Musketeers, and she sets out to Paris to fulfil her dream, accompanied by her cat Miette and horse Alexander. Once in Paris however, she is ridiculed by the Musketeers for the idea of a girl wanting to join them. She takes a job as a maid at the palace, only to find that her three co-workers, Aramina, Renee and Viveca, all harbour ambitions to be Musketeers too. The aging Helene shows them the secret Musketeer training room in the palace and begins teaching them how to fight. Corinne then uncovers a plot by the regent Philippe to kill the prince Louis during his coronation ball. It is up to the four wannabe Musketeer girls to come together to foil the scheme. Barbie and the Three Musketeers was the sixteenth animated film featuring the classic girl’s doll Barbie produced by Canada’s Rainmaker Entertainment (previously Mainframe Entertainment). The other animated Barbie films include Barbie in the Nutcracker (2001), Barbie as Rapunzel (2002), Barbie of Swan Lake (2003), Barbie as The Princess and the Pauper (2004), Barbie Fairytopia (2004), Barbie and the Magic of the Pegasus in 3D (2005), Barbie in The 12 Dancing Princesses (2006), Barbie Mermaidia (2006), Barbie Fairytopia: Magic of the Rainbow (2007), Barbie as The Island Princess (2007), Barbie & the Diamond Castle (2008), Barbie in A Christmas Carol (2008), Barbie Mariposa (2008), Barbie Presents Thumbelina (2009), Barbie: A Fashion Fairytale (2010), Barbie in a Mermaid Tale (2010), Barbie: A Perfect Christmas (2011), Barbie: A Fairy Secret (2011), Barbie: Princess Charm School (2011), Barbie in a Mermaid Tale 2 (2012), Barbie: The Princess & The Popstar (2012), Barbie and Her Sisters in a Pony Tale (2013), Barbie in The Pink Shoes (2013), Barbie Mariposa and the Fairy Princess (2013), Barbie and the Secret Door (2014), Barbie: The Pearl Princess (2014), Barbie and Her Sisters in the Great Puppy Adventure (2015), Barbie in Princess Power (2015), Barbie in Rock’n’Royals (2015), Barbie and Her Sisters in a Puppy Chase (2016), Barbie Spy Squad (2016), Barbie Star Light Adventures (2016), Barbie: Dolphin Magic (2017) and Barbie: Video Game Hero (2017). Several of the other Barbie films have adapted classic tales, usually fairytales but occasionally other classic stories like A Christmas Carol (1843) and The Prince and the Pauper (1881). Here Rainmaker have turned to Alexandre Dumas’s The Three Musketeers (1844). This story has been extremely popular on cinema screens with there being some twenty-five film adaptations (although it should be noted that none of these are fantasy films). That said, the story has also been conducted in animation before with the Tom and Jerry short The Two Mouseketeers (1952) and Disney’s Mickey, Donald and Goofy: The Three Musketeers (2004). 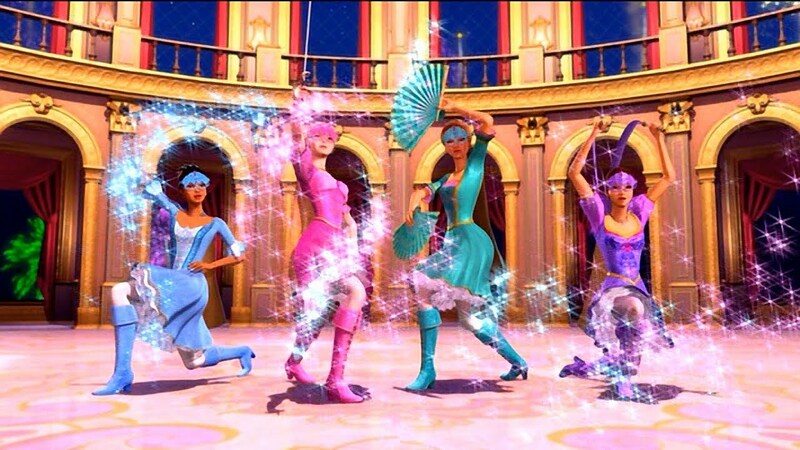 Barbie and the Three Musketeers loosely follows the Dumas story – or at least finds equivalents of aspects of it. Like D’Artagnan, Barbie sets out to join the Musketeers with a letter of introduction, insults the characters that will later become her companions, is rejected from the Musketeers after the letter is lost and accepts a lesser position (becomes a maid in the palace here, joins a different regiment in the book), before foiling a dastardly plot. Largely though, it is The Three Musketeers fed through an absurdly happy Girls Can Do Anything vibe (even if the supporting trio of girls all seem self-absorbed airheads) and overrun with a ‘Dream All You Can Dream’ positive thinking ditty. You get switched off by Rainmaker’s relentlessly upbeat treatment of the Dumas story from the opening credits in which the Musketeers catchphrase of “all for one and one for all” has been spun out into an incredibly banal song. Or the introduction a couple of scenes later of talking animals cracking jokes about mus-cat-eers and cat-astrophes. The four girls go into action, whipping off their ballgowns to reveal corset outfits underneath, while accompanied by a reworking of the EMF song Unbelievable (1990), which is actually a song ridiculing a self-absorbed girlfriend but here becomes a self-empowerment anthem ‘We’re Unbelievable’. The Musketeer girls never get to wield swords, which have no doubt been excised because this is a children’s film, something that kind of guts the essence of any film version of The Three Musketeers. Thus they go into combat with weapons that include the likes of fans, perfume, ribbons and violin bows. The villain’s despatches are all slapstick ones – dumped in horsefeed and with horseshoes falling on their heads. Barbie and the Three Musketeers also ends up being one of the weakest of the Barbie films. The pitch is towards easy humour with talking animals or slapstick antics, although most of this feels awkward and forced. The animation of some of the films preceding this had been developed towards a surprisingly high quality but here for some reason it is much weaker, back towards what it was in the earlier Barbie films. It feels, more than anything, like a Rainmaker test reel rather than a full-fledged film.